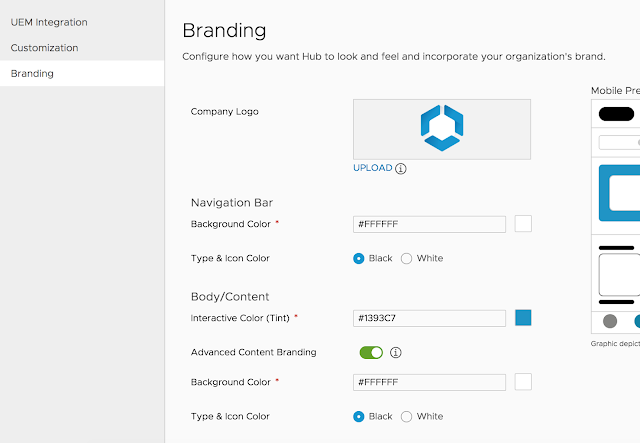 Workspace One Intelligent Hub has been generally available since late October 2018. It's essentially an updated and rebranded version of the AirWatch agent, with the major added capability of providing an app catalog. 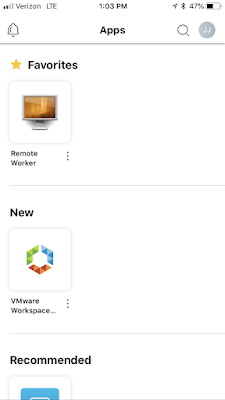 Before it's release, if you wanted the full blown Workspace One experience on your devices you needed to install both the AirWatch agent and Workspace One App. Now all that functionality can be delivered through this single new app, the Intelligent Hub. Intelligent Hub has full feature parity with the former AirWatch agent. 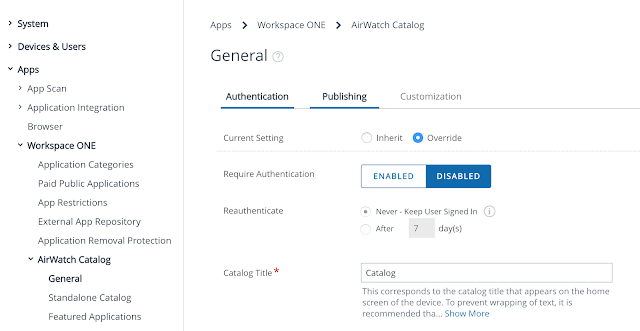 For pure Workspace One UEM (AirWatch) deployments there's no real difference aside from the name changing and rebranding. However, the new catalog functionality it offers introduces dependencies not previously required by the Workspace One App it's intended to replace. To provide catalog services from Intelligent Hub you need to configure Hub Services ahead of time. 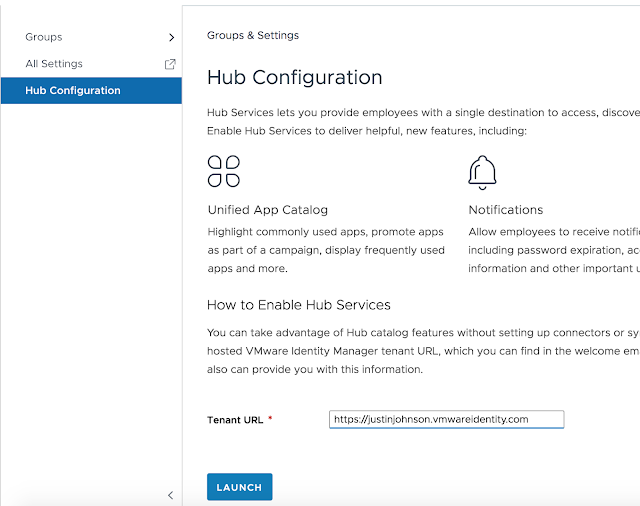 These Hub Services are co-located in VMware Identity Manager cloud-hosted environment and are an absolute requirement if you want to provide an app catalog directly from the Intelligent Hub app. As a cranky techie that hates change, initially I was a bit put off by this new app. The prospect of a migration from the Workspace One app to Intelligent Hub was intimidating, especially given the new dependencies. However, there's a couple pieces of good news that really mitigated my concerns. First, the configuration of Hub services isn't exactly rocket science. 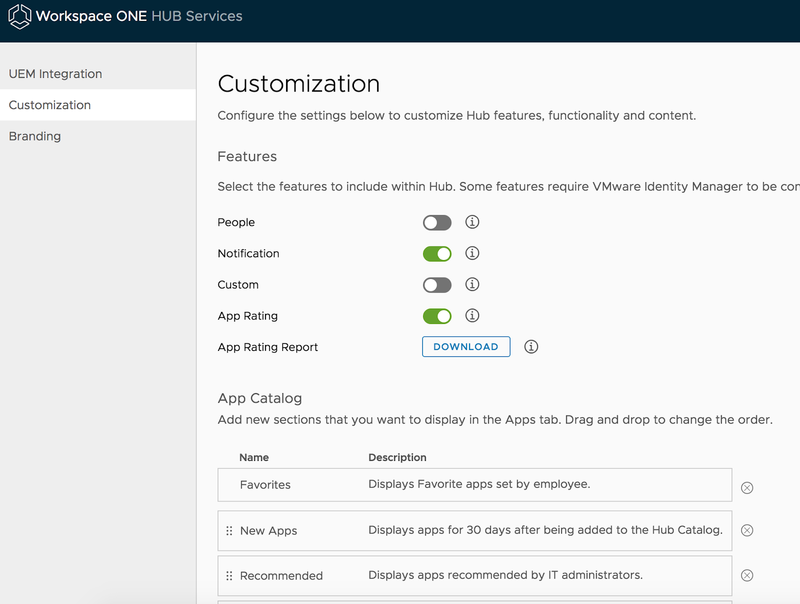 Configuring Hub Services within my Workspace One lab environment, one that already had vIDM and Workspace One UEM fully integrated, was for the most part straight forward and uneventful. Second, the Intelligent Hub app, even with it's Hub Catalog enabled, can run side by side with the Workspace One App on the same device. So you can configure and enable Hub Catalog on endpoint devices, but can postpone an actual migration from the Workspace One App till a more convenient and opportune time for you users. 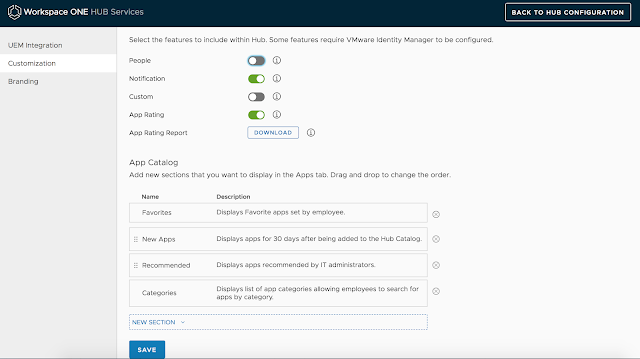 Unfortunately, Hub Catalog isn't currently supported for on premise implementations of vIDM and only works with vIDM cloud-hosted. 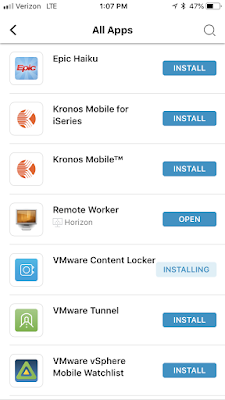 So customers using on premise vIDM for a Workspace One deployment should continue using the Workspace One App for catalog services. 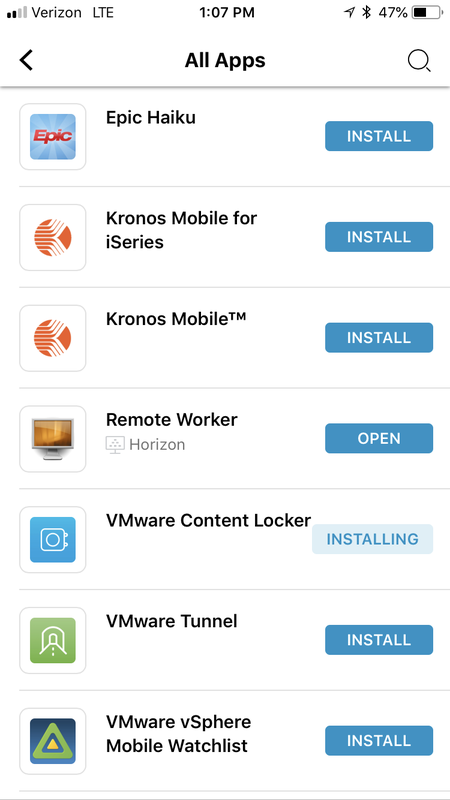 The same goes for folks using a 9.x version of Workspace One UEM (AirWatch). They can continue to use the Workspace One App app as well. Otherwise, for folks who'd like to take the Hub Catalog for a test spin, here's the steps I followed to enable the Hub Catalog in my own lab environment. 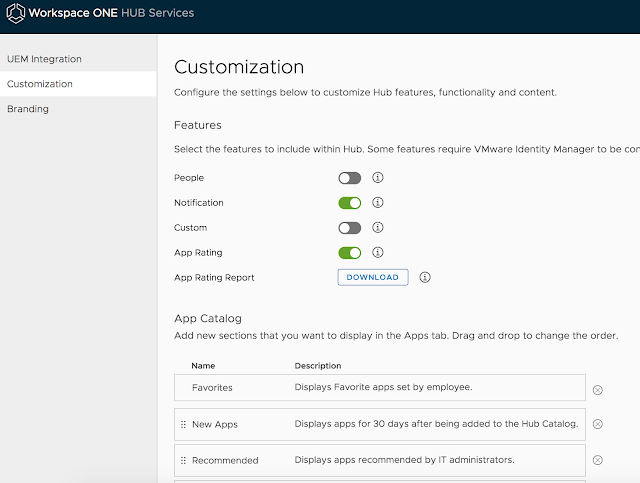 Both the Workspace One UEM and vIDM include links to Hub Configuration. Within the Workspace One UEM console, it can be access from Groups & Settings --> Hub Configuration. On this initial Hub Configuration page, I entered in my vIDM tenant URL and then clicked Launch. At the customization page, I accepted the defaults. Next, I accepted the defaults for branding and clicked save. Phhhhheeeeeeeeewwwwww!!!!!! Tired yet? Well dig deep and push just a little harder. We still have a few buttons to push. The official guidance indicates that when fully integrating Hub Services with vIDM, you need to select Identity Manager as the source of authentication for Intelligent Hub. Accordingly, I navigated to Devices > Devices Settings > Devices & Users > General > Enrollment, then selected Identity Manager authentication manager as the source of authentication for Hub and clicked save. Finally, I had to publish the Hub Catalog for iOS. To do that, I navigated to Groups & Settings > All settings > Apps > Workspace ONE > AirWatch Catalog > General. Then I clicked override, enabled Hub Catalog (iOS) and clicked save. I also found the self service catalog for the provisioning of mobile apps I'd been entitled to. Great article! You have done a great job in introducing the Hub to folks who are familiar with good old Workspace ONE app.